It’s been a while since I have painted a bee but, in February 2019, I am delighted to say “Buzz” the Bee paintings will be returning to Easton Walled Gardens. They will be part of a “Plants and Pollinators” exhibition. My work will be alongside the lovely botanical paintings of Dawn Wright see her website here. https://www.dawnat29.com/. This bee and another favourite, the female woolcarder bee, have never been made into prints and for this show I will be making a few prints of these for sale, as well as a new watercolour. 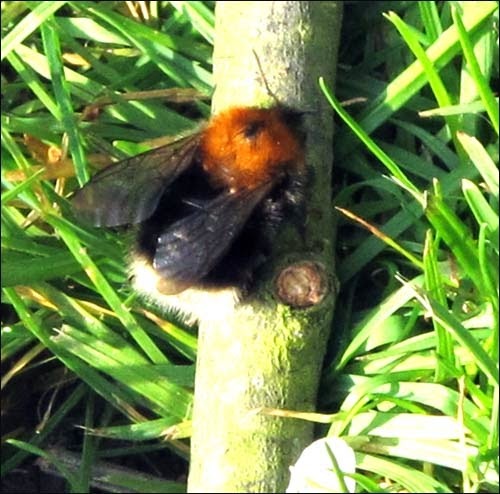 I have chosen the Tree Bumblebee, Bombus hypnorum, as Easton was the first place I saw this feisty little bee, collecting pollen from an early flowering espaliered cherry tree, in the spring of 2011. Back then it was relative newcomer and so had not made it into my original British Bee exhibition. I have decided the painting will be of the little bee perching amongst the cherry blossom just as I had first seen her. As usual my working method is this: Thumbnail sketch to think about layout: then build the body shape of the bee, then “flesh” it out. Construction of the bee form. I am looking forward to making detailed painting again..I just hope I can do it!